Introducing Buck Knives' first set of spears! As a leader in sports cutlery, it only makes sense that they provide one of the most basic and primitive hunting and survival tools known to man, but Buck offers them with their 100 plus years expertise on edged tools. The Kinetic Spear Series contains three spears that can easily be lashed onto the haft. The Hunting Primitive hunting at its finest! Introducing Buck Knives&apos; first set of spears! 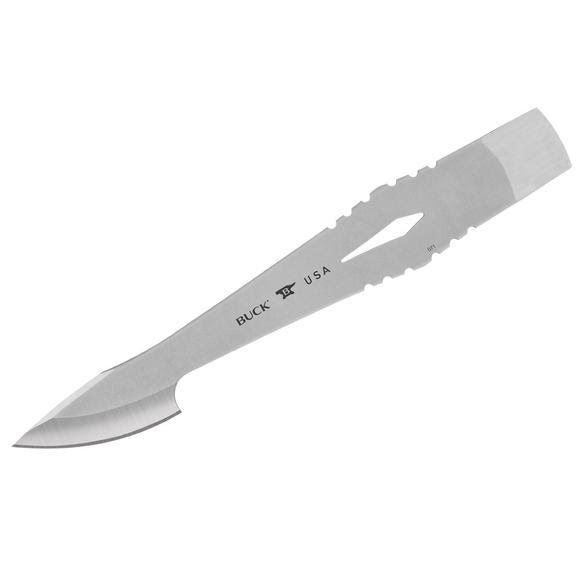 As a leader in sports cutlery, it only makes sense that they provide one of the most basic and primitive hunting and survival tools known to man, but Buck offers them with their 100 plus years expertise on edged tools. The Kinetic Spear Series contains three spears that can easily be lashed onto the haft. The Hunting Primitive hunting at its finest! The Kinetic Hunting Spear features a 2 1/2&apos; drop point blade, perfect for hunting small game. The hunting spear can be mounted to a spear pole (not included) easily by utilizing the chisel point and 550 cord (included). With an overall length of 9 1/8&apos;, the hunting spear is the perfect size for the task. Comes with a heavy-duty polyproplene sheath. If you are looking for an exhilirating hunting experience, the Kinetic Hunting Spear is right for you. For more primitive hunting options, see our other products in the Kinetic Spear Series lineup. Please follow all safety instructions.